I think a hangover makes jet-lag so much easier to bear. Eventually I arose Monday morning and decided to do the tourist bit, so headed to the City centre in one of the many millions of taxis that constantly patrol the streets. Don’t get into a taxi and ask for ‘Haggia Sofia’ even though the tourist books call it that. To the locals, and the big new brown tourist signs, it is ‘Ayasofya’. I’m still not sure if they are referring to the actual former Church of Saint Sophia, the Church of ‘Holy Wisdom’; or it is just the area around the church/mosque/museum. It strikes me that many churches in the UK, especially in Silly Suffolk where I live, have become museums as nobody goes to worship there anymore. I find it quite offensive to be charged to visit the great cathedrals in Britain. After all they were made by the blood, sweat and tears of men striving for the greater glory of God. To me it’s a museum with an entrance fee or it is a church; you can’t have both unless you want to expose the hypocrisy behind the Business of Religion. Fate took me in on Monday to discover the ‘Museum’ is closed. So time for my own explorations. First thing was to get brunch at the ‘Green café’, a fantastic little outdoor café sheltered by trees. It is just to the west of Saint Sophia; great place to watch the world go by. From there a walk up to Sultanahmet, along the old Mese way, a route through the City for more than two thousand years. The modern trams and motorcycles clunk along streets pounded by footsteps of Legionnaires, Crusaders and Saracens, mechanically oblivious of the souls of the past. How much blood has run down these streets? I called into a bookshop, purchased a ‘History of the Middle East’ and ‘Selected Poems of Rumi’ – I was in the home of the Sufi’s so Rumi was a must! 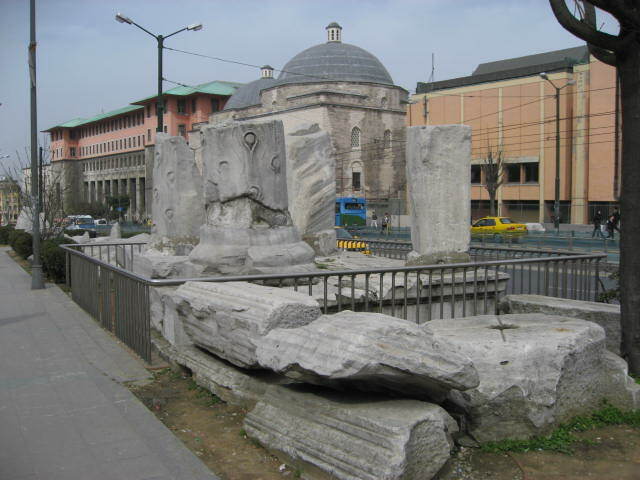 On up the hill, past Churches that are Mosques, Universities, The remains of the Arch of Theodosious, large lumps of marble lying prostrate since AD 740 when the city was shattered by an earthquake; another reminder of our insignificance – who the hell was Theodosious? Will there ever be an Arch erected to honour Swifty? On this route I witnessed my first street fight for years. There was a row of taxis touting for business and I am guessing that one of the drivers was trying to queue jump. There were shouts, then pushing and shoving, and then no doubt some of the words were Turkish expletives, then crack, a fabulous right hook. End of fight really. Forget all of the Hollywood screen fights. Trust me if you ever get one solid punch in the face then it is game over; probably with a fractured jaw or cheekbone. I remember breaking my little finger during a bit of free style sparring in a karate session as I caught my opponent a glancing blow to his hip. John Wayne should have been dead in every bar fight! There was a need to visit the Grand Bazaar again, though I know it is full of tourist tack and overpriced souvenirs. I treated myself initially to the Book Souk as I love the name; plus there is a Philatelist or two buried away in some of the shops. Then through the fake Armani jeans, Tommy Hilfiger Shirts and Burberry Hats. Inside is different as there are some genuine leather shops – but bargaining is the key. Always offer half of the stated price and move on from there; if you feel really confident offer one third of the price! Back down the hill to a pavement café, doors open onto the street; beers and a seafood dish and a read of Rumi. This entry was posted in Motivation, Travel, writing and tagged beer, fish, go for it, inspiration, travel, Writer, Writing. Bookmark the permalink.